The C8 Corvette prototype that rolled through New York City on Thursday evening gave us the best look at the next generation sports car since they appeared at the Nurburgring. That’s because these cars appeared to be in mostly production form and do not have the same level of camouflage on them as some of the development prototypes we’ve recently spied while testing. This “nearly-naked” view of the Corvettes also allows our designer friends who render the car the opportunity to fill in some additional details. We shared with you the front-end rendering with updated headlights from Chazcron over the weekend and now we have a new update from our friend FVS (FirstVetteSoon) and the Mid-Engine Corvette Forum. 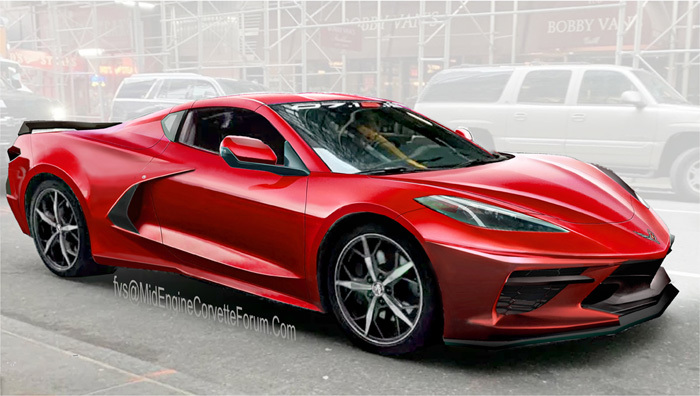 For this render, FVS chose one of the actual photos of the C8 Corvette being driven by Chief Engineer Tadge Juechter with Mary Barra in the passenger seat as his starting point, and then shows a Torch Red C8 rendered over it, saying it’s his “best guess at what is under the camo…”. It’s interesting how Chazcron and FVS show some of the hidden design cues differently as they, like us, are waiting for the reveal to finally show how the Corvette will appear. We know there are three different exterior trim levels from the leaked RPO details and both designers have tried different looks at how they might be incorporated. FVS incorporated the Carbon Flash trim for the mirror holders, front grill insert, scoop cover and rear wing spoiler and I think that’s a great look for the car myself. Other choices will include body color or Dark Shadow Metallic, but we’ll have to wait until the reveal to see exactly where the trim will be located. I also noticed that FVS left the Zora sticker on the door and passenger rear view mirror. Many agreed with us when we said we’d like to see a shoutout to Zora Arkus-Duntov on every level of the Mid-Engine Corvettes so hopefully, Chevy will do something in regards to that. Do you like the latest rendering from VFS? Let us know in the comments below or head over to the MECF and jump in the conversation! I like, he did a great job just hope I can get my hands on one before Nov. The Side Scoop on the Camo one is Definitely different than the Rendered ones – looks more boxy. Like the rendered ones better – but cant see anything on the real one in NY (or otherwise) that justifies the swept back scoop rendering -HOPE i am missing somethig! Sorry to Mark – guess I was supposed to put my name below my entry above! The more I see the C8 design get closer to reality, the less excited I get. Its OK, but definitely not a world beater. I think GM Design is losing it’s mojo. Another case in point: the upcoming Cadillac CT5, which looks more like an Oldsmobile and nothing like a true luxury car. Very discouraging. I put my deposit down to get on the list to order, but I’am still not totally thrilled. we’ll see on July 18th. Those side windows look smaller than on the latest camaro! Where are the hidden wipers, like in the ’70s? That door mirror is ugly as HELL & TOO BIG! 4 rotor corvette looks much much better! I have not bought a new car since i could no longer order an ALL BLUE interior.